Velveteen Rabbi: מאי המנתשן / Why hamantaschen? Velveteen Rabbi's Haggadah for Pesach! מאי המנתשן / Why hamantaschen? Despite the lovely savory hamentaschen recipe posted recently at the Jew and the Carrot, I decided to go oldschool and to make good old-fashioned sweet hamentaschen to bring to my shul for our Purimspiel tonight. But Ethan asked me a fine question while I was baking: what's the story with hamentaschen? As a kid I learned that Haman (boo!) wore a tricornered hat. 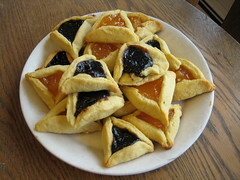 These tricornered cookies are called "hamantaschen" which means "Haman's Hat" (actually Haman's Pocket, but close enough) and we eat them as a sign of our triumph over Haman. In adulthood it's become clear to me that this is an anachronism (among other things, tricornered hat? in ancient Shushan? really?) but it's still an entertaining drash, mostly because it allows me to picture Haman as a kind of arrogant little Napoleon. If you're interested in tracing the history of hamantaschen through classical Jewish source texts, there's a great post here at Seforim blog. Eliezer Brodt cites sixteenth-century Italian Jewish plays, Renaissance liturgical parodies, and nineteenth-century Lithuanian memoirs in his exploration of hamantaschen's origins. If you're into the comparative-religions view, you might dig Naomi Chana's 2004 post which notes the clear link between Mordechai and Marduk, Esther and Ishtar -- which leads me to wonder whether these notably yonic cookies were originally cakes for the Queen of Heaven, like the ones Jeremiah denounces in chapter 7, verse 18 of the book which bears his name. Making hamentaschen is like making dumplings. If the corners don't seal properly, they lose structural integrity in the cooking; in my first batch today two cookies came entirely apart, turning into discs of dough with filling on top. (I had to eat them. It was tragic, really.) So if you make them, pinch the corners firmly! Whatever they mean, and wherever they come from, they're yummy. B'teavon / bon appetit! Sift the dry ingredients (including sugar) into a bowl. Beat the eggs, oil, juice, and rind and stir into the dry ingredients. Knead dough lightly until smooth. 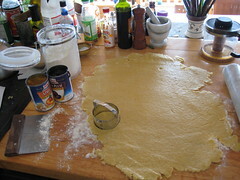 Roll dough to 1/8" thickness and cut into rounds (I use a biscuit cutter; you could also use a drinking glass.) Put a spoonfull of filling* in the center of each round. Fold edges inward and pinch at the corners /_\ to form a triangle. *For filling, you can use jam, canned pie filling (apricot and plum/prune are classics, though cherry would probably work well too), nutella...whatever sounds good! Bake on a greased baking sheet at 375 degrees for 15 minutes or until lightly browned. Makes about 4 dozen. Enjoy! Technorati tags: religion, Judaism, Purim, hamantaschen.